Philip Levine passed away in February 2015. At the time of his death, he was one of this country’s most honored poets, having been awarded the Pulitzer Prize for Poetry, two National Book Awards, a National Book Critics Circle Award, and numerous other honors and prizes. He served as Poet Laureate of the United States from 2011–2012, a fact that is eminently appropriate given that his legacy is a body of poetry rich in the rhythms of Middle America, a clean and studied lyric plainsong translating what it has meant—and what it currently means—to work in the USA, most specifically, to have been an auto-industry shift-worker in the great economic engine that was Detroit in the mid-20th century. While Levine proceeded to complete a university education and to teach for many years at Fresno State University in California, his poetry remained true to—and thematically aligned with—his midwestern working-class roots. His poems, some of which are, at first glance, straightforward, exhibit upon closer examination the prosodic complexity of a carefully worked and reworked conversational metric. The collection is divided into three parts, the opening poems chronicling Levine’s childhood and youth in Detroit, his work, for example, at “The Chevy stamping plant/commandeered by clans/of enormous rats . . .” as outlined in the poem, “Leaves.” The mechanized efficiency that has become the first principle of the assembly-line ethic is often undermined—if not sabotaged—in these poems by the lushly destructive and rank disorderliness of the life-force. In “The Absent Gardener,” for example, Levine bids us “Go back to early April of 1949” to witness a real garden plot, rife with “. . . the perfumes of wet black dirt,” recently turned, the earth-scent in stark contrast to the rusty-smelling air characteristic of the motor city. Levine worked the night shift in his youth, and that shift-work stayed with him, measured against the shadows and the light of the decades that followed. Part II of this collection opens with “Immortal Birds,” a poem that finds Levine in California with “. . . a battered scrub jay . . .” in his backyard lemon tree. “Where are the fabled birds we/read about? . . .,” he muses. The poems that follow track Levine on multiple journeys, in search, perhaps, of those mythic birds, a search recorded faithfully in the down-to-earth cadences of a night-shift worker from Detroit. This poem involves a series of ontological speculations and imaginings. One wonders if the abilities or incentives to weep have gone away. Levine deeply explores landscapes and the theory of place in these poems, utilizing past and future to bind the reader to his prevailing meditative present. Sparrows in Detroit, jays in California, and a half century in between, knitting these common birds—this common life-force—into Levine’s private mythos. There is, it seems, a thread of silence woven through a posthumous collection of poetry. There will be no edits, no rewrites, no second takes. Plus, of course, the arrangement of these poems, though masterfully handled by Hirsch, is not necessarily the arrangement Levine might have used. In this collection, nonetheless, Levine has had, in a very real way, the last word. Perhaps not a moment too soon for Levine, but certainly too soon for his readers. The meditative music of Levine’s deeply thoughtful, elegiac poetry will echo in the literary memory of this country. His stark working-class realities together with his “fabled birds” now populate our imaginations, just as they populated his. 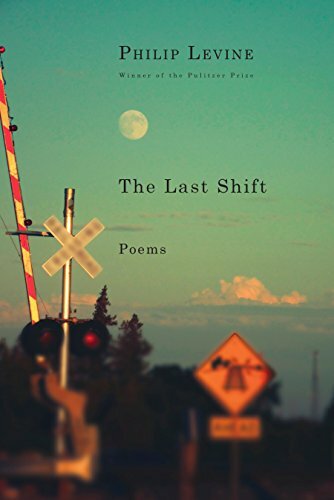 This stunning final collection is one more reminder that Philip Levine is irreplaceable.